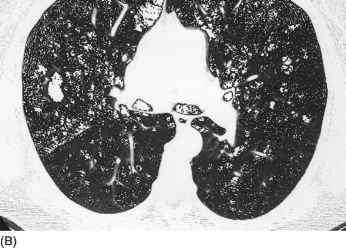 The fundamental difficulties of lung imaging with MR can thus be overcome by these new imaging techniques that are fast, have high signal-to-noise ratio, and are insensitive to local magnetic field inhomogeneities. For example, we have seen how the use of a single-shot TSE sequence for ventilation MRI dramatically reduces the impact of local magnetic field inhomogeneity and motion artifacts. Similarly, we have described how the use of FLASH sequences with ultrashort TE (0.9 msec) for perfusion MRI overcomes the short T2* found in lung tissue. Combining these MR techniques, Chen and colleagues have been able to accomplish integrated pulmonary ventilation and perfusion MRI using oxygen and gadopentetate dimeglumine as contrast agents, respectively [33,50]. The perfusion sequence used by Chen et al. 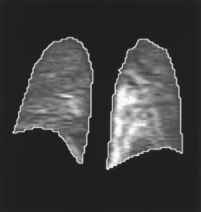 balanced temporal resolution with the amount of lung imaged. A temporal resolution of under 300 msec could be obtained for a single slice acquisition or of 2-3 sec for any given slice in a multislice acquisition. The overall coverage comprised 60 mm in the coronal plane and could be increased by reducing temporal resolution or administering further contrast. The duration of the sequence was sufficient to evaluate both the first pass of contrast medium as well as recirculation. SNR has been observed when compared to regular HASTE sequences. The short effective time (TEeff = 4.2 msec) resulting from the centric reordering method maximized the signal contribution from short T2 lung tissue, but this increase in signal occurred at the expense of some loss of spatial resolution. The discontinuity of MR signals at the center of K space causes image blurring and the later echoes obtained are mainly noise due to the long acquisition time (538 msec) and short T2 values in the lung. When these noisy echoes are in the periphery of k space, spatial resolution information is poor. The perennial MR trade-off between signal-to-noise and between coverage and resolution again needs to be balanced. Advances in parallel imaging, including simultaneous acquisition of spatial harmonics (SMASH) and sensitivity encoding (SENSE) methods, may help in this regard. These new techniques, which exploit the properties of arrays of multiple receiver coils, may thus play a role in the future of pulmonary MR imaging. The SMASH technique exploits spatial information inherent in a phased array coil. Several lines of K space are acquired simultaneously, and this technique can be used to reduce imaging time or increase resolution without any requirement for improved gradient performance . SENSE is also based on the fact that receiver sensitivity generally has an encoding effect complementary to Fourier preparation by linear field gradients. Thus, by using multiple receiver coils in parallel, scan time in Fourier imaging can be considerably reduced and MRI performance potentially greatly enhanced . The study by Chen and colleagues clearly demonstrates the ability of MRI to assess both regional pulmonary ventilation and perfusion. In their model of airway occlusion, a mean 11-fold increase in ventilation signal enhancement was seen in the normal lung compared with the obstructed lung. This indicates that oxygen is a feasible MR contrast agent for the evaluation of regional ventilation impairment. In the same experiment, MR perfusion imaging showed an associated decrease in perfusion signal enhancement in the obstructed lung, likely reflecting hypoxic vasoconstriction. 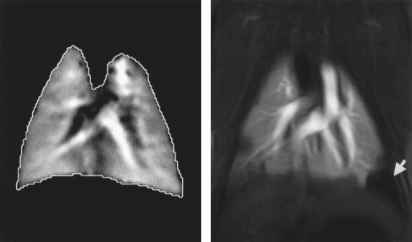 The ability to image the basic functions of the lung with this precision is highly promising. In their model of pulmonary embolism, mismatched ventilation and perfusion patterns were observed in all animals. Perfusion defects were seen in regions distal to the thrombi, whereas no ventilation abnormalities were detected in any animals (Figs. 10 and 11). Mismatched ventilation/perfusion abnormalities (reduced perfusion with normal ventilation) suggest a high likelihood of PE, whereas perfusion defects accompanied by abnormal ventilation are unlikely to represent pulmonary emboli. Figure 10 Pulmonary embolism model: mismatch of normal O2 MR ventilation (A) and gadolinium DTPA MR perfusion (B) with perfusion defect in left base (arrow). ventilation was assessed using aerosolized gadopentetate dimeglumine as a T1 contrast agent and pulmonary perfusion was assessed with intravenous administration of polylysine gadopentetate dimeglumine. Their results confirmed that simultaneous assessment of ventilation and perfusion improved the specificity of contrast-enhanced perfusion MR imaging. The same group has also used hyperpolarized 3He as the inhalation agent to assess lung ventilation function, along with lung perfusion proton imaging using contrast agent injection. Both imaging techniques have been implemented using projection-reconstruction sequences with free induction decay signal acquisitions. Their projection-reconstruction sequences allowed 3D data set acquisition in several minutes without high-performance gradients. They have also demonstrated normal lung ventilation associated with defective lung perfusion on an experimental rat model of pulmonary embolism .